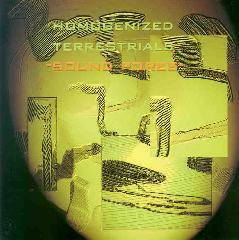 Homogenized Terrestrials - "Sound Pores" / "Patience Is A Fuse"
Homogenized Terrestrials is a solo project from Phil Klampe who has been playing music for nearly 18 years and has collaborated with, among others, Hal McGee, who's Alien Progeny CD was my introduction to Phil's music. Phil has an extensive catalog of music from over the years, with the two reviewed discs being the most recent from Homogenized Terrestrials. Sound Pores consists of ambient electronic music that sounds like it may include guitars and real percussion. The music flows slowly and smoothly but has enough going on at once to keep the attentive listener's interest throughout. Trippy acidic lines, ambient backdrops, bits of symphonic keys, pulsating waves, gradually shifting melodic patterns and the occasional drone all come together to create a peaceful but enjoyably distorted cosmic world. But despite its ambient nature, this is music that transitions through a continual stream of evolving themes. The patterns are simple but continually shifting and there's plenty of experimental stylings and fun alien sounds to spice things up. One minute you'll be rolling over the landscape of some distant, seemingly barren, planet... and the next thing you know the tectonic plates come crashing together... or you've encountered hostile inhabitants... or... hey, this is cinematic stuff. But it's a voyage rather than an action packed adventure. I especially like the carnival atmosphere that gets pounded by shooting UFO blasts on "Triggers". And the percussion on "Skin Corruption" is a key element with a melodic quality that I enjoyed. And with a couple tracks that clock in at 14 and 30 minutes there's plenty of room for Klampe to shape and develop his aural landscapes; something he does with the finesse of a sonic film maker or storyteller. 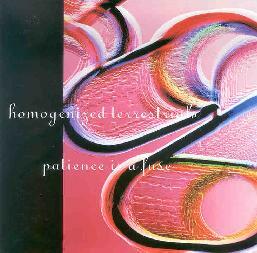 Patience Is A Fuse is the latest release from Homogenized Terrestrials. The tracks are mostly shorter, more concise statements, and while the music is similar to Sound Pores it's more of a minimal development of basic themes than the full length feature film workouts heard on the earlier CD. That's not to say it isn't enjoyable because Klampe does an excellent job of expounding on his themes within more limited time frameworks. The opening track, "Tempel", is one of my favorites, being an investigation into pitch and tone that varies little from it's theme but challenges the senses with its cavernous clangs that rumble in the head and chest. "Birth Cycle" is similar but far more cosmically freaky. Guitar is overtly recognizable on "One Button Released". And there's variety too, as the percussion workout of "Chi" segues to the bubbling spacey "Pursuit Of Dreams"
In summary, Patience Is A Fuse is an intriguing collection of ideas, including some interesting experimental exercises. But Sound Pores get my highest recommendation to fans of space electronic sound sculptures. Klampe's constructions are musical, experimental, ambient, richly textured, and structured such that you would think he'd been commissioned to do a sci fi soundtrack. For more information you can visit the Homogenized Terrestrials web site at: http://www.homogenizedterrestrials.com. There are loads of Homogenized Terrestrials tunes waiting to be heard at their Mp3.com web site: http://www.mp3.com/HomogenizedTerrest. Contact via snail mail c/o 6 On The Dot; PO Box 313; Peru, IL 61354.